Kyle Schmidt, Fiberglass Structural Engrg. GET DONE FASTER — Use CAEPIPE's carefully designed features for rapid modeling, powerful analyses with quick solution times, and easy results review. You will benefit from being able to quickly evaluate alternate design solutions ("what-if" scenarios). 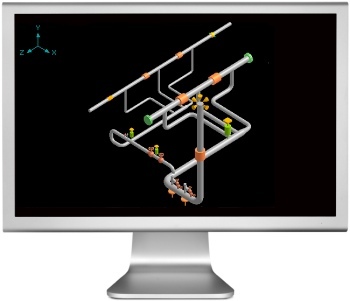 AVOID FRUSTRATION — Work with the elegantly simple and intuitive user-interface to model or edit simple or complex piping problems. SAVE MONEY — First, CAEPIPE costs less, second, you will see dramatically increased productivity and third, there are no (re)training costs. CAEPIPE pays for itself much faster than others do, if at all. Multiple open windows providing simultaneous visual and textual feedback on different aspects of the model. Aids rapid and accurate understanding of model behavior and details. Synchronized Highlight (in all open windows) for easier pinpointing of nodes, elements and other items. Eliminates confusion and helps you to focus on the issue. Dynamic updating of data across all windows (make one change in one window and all other windows reflect the change). Fewer keystrokes and mouse movements to go through; Flexibility and instant visual feedback. Advanced MS-Windows technology for fast operation (memory mapped files, intelligent repainting, multithreading etc.). Results in extremely fast operation, and quick analysis times. Single-click editing in Graphics window for alternative modeling. Two ways of editing model (not forced to textual screen editing only).